There is a special village in India where people not only worship bats but they think that the bats protect them. We are talking about Sarsai village, situated in Vaishali dsitrict of Bihar. The people of Sarsari village thinks that there is no shortage of money where the bats live. However, it’s still unknown as to where the bats of Sarsai village originally came from. There is always a crowd of visitors to see these bats. The people liken these bats to Goddess Lakshmi, the Hindu deity of wealth and fortune. They stay in Peepal, Samer, Badua trees located near an ancient lake at the center of the Sarsai Village. This lake was constructed by the King of “Tirhut” Shiva Singh in 1402 B.C. A 50 acre area of land adjoining this lake also contains numerous temples. According to the villagers, the bats start screaming if anyone from outside the village goes near the lake at night but do nothing of the sort if anyone from the village does the same. Such is the respect for these bats here that any religious ceremony is incomplete without bats. A constant increase in the number of these bats which have made the peepal trees in the village their home has been recorded. The villagers also protect these protect these bats apart from worshipping them. Any auspicious event is incomplete without a customary offering to these bats. The villagers say that a great epidemic hit the Vaishali in medieval times in which many lost their lives. It was during this time that the bats first came to this village and as the villagers say, the village has never become a victim of another epidemic ever since. 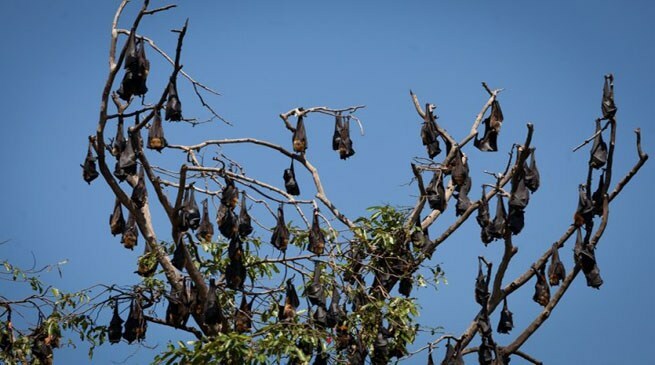 Experts say that there is substance to villagers’ story as bats emit a certain odour which contains chemicals that kills the bacteria which negatively affect the human body. The presence of bats in such a large number though unheard of, is still heart-warming.